Samuel Fuller is one of my heroes. A man of staggering talent as a novelist, screenwriter and director, his films are among my favorite because they’re flat out pulp. Sometimes lurid pulp, sure. But isn’t that the best kind? I like Mr. Fuller’s movies a lot because there’s no pretension in them. And the protagonists of a lot of his movies aren’t heroic or even likeable. He serves them up exactly as they are and he lets you decide who and what they are. And as a result he comes closer to art than writer/directors who deliberately start out with lofty goals of cinematic immortality. Sam Fuller just wanted to tell a good story. And SHOCK CORRIDOR is one of his best. 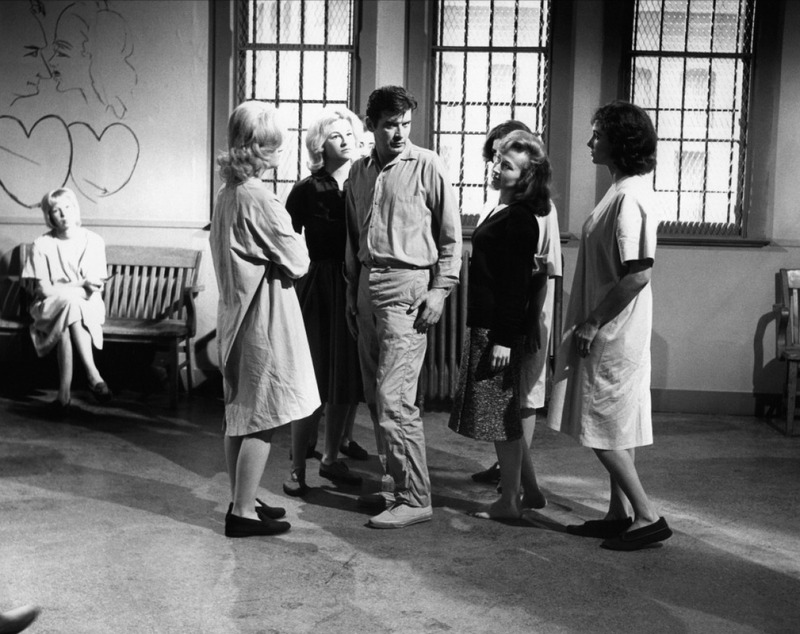 Johnny Barrett (Peter Breck) is already touched with a kind of madness when we first meet him. He’s being coached by Dr. Fong (Philip Ahn) how to behave like a sexual deviant. Johnny’s madness is the single-minded pursuit of fame and he’ll do anything to write a Pulitzer Prize winning story. Even if the story is inside of an insane asylum. Johnny is determined to solve a murder that took place in the facility. There are three witnesses to the murder and they’re all insane themselves. Johnny’s plan is simple: he’ll pretend to be insane, get himself committed to the asylum and then question the three witnesses, solve the murder, write the story and collect his Pulitzer. Hell, he may even get a book or movie deal out of it he excitedly explains to any one who will listen. His stripper girlfriend Cathy (Constance Towers) hates the plan and thinks that if Johnny spends too long in there, he’ll end up with the spots on his dice missing as well. But the plan needs her co-operation as she has to pretend to be Johnny’s sister and swear out a complaint against him. Johnny gets inside and begins his investigation. But it’s nowhere near as easy as he thought it would be. After all, it’s tough pretending you’re crazy when you’re not. Unless, of course you happen to be surrounded by madmen more than willing to show you how it’s done. And those megavolt shock treatments don’t help either. Or being raped by nymphomaniacs. And you stick to your cover story of your girlfriend being your sister to the extent that you actually start to believe she is your sister. Johnny doggedly pursues his quest and pieces together clues even while his own mind starts to come slowly apart. SHOCK CORRIDOR is one of those movies made with such raw fearlessness that it amazes me that it was made during the 60’s. 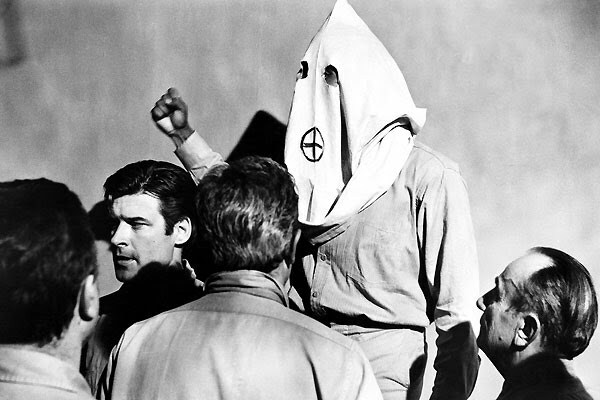 Sam Fuller isn’t afraid to go for broke and his depictions of the various kinds of crazy suffered by the inmates range from humorous to downright horrifying. There’s a big, friendly bearded bear of a guy who calls himself Pagliacci and sings opera. At the other end of the spectrum there’s Trent (Hari Rhodes) who was the first black student admitted to an all-white Southern college. Trent cracked under the strain of living in what was for him enemy territory. And when I say he cracked I mean he busted wide open. Trent steals pillowcases to make hoods, declares himself Grand Wizard of The KKK and spends his days inciting attacks on the other black inmates and giving brutally racist monologues. It’s Hari Rhodes who steals the acting honors in this one. Trent is truly a terrifyingly tragic character and Rhodes plays him for all he’s worth. Peter Breck never impressed me much as an actor and I attribute his amazing performance in SHOCK CORRIDOR to Sam Fuller’s direction. It’s a brutally comprehensive character arc Johnny Barrett goes through and Breck is totally committed to selling the character and the story. Constance Towers is good here as well, equally as good as she is in “The Naked Kiss” another Sam Fuller movie that you should definitely check out. So should you see SHOCK CORRIDOR? Chances are if you’re familiar with Sam Fuller you already have. If you’ve never seen a Sam Fuller movie then this is a great one to start with. I also highly recommend “The Steel Helmet” “The Naked Kiss” “Forty Guns” “The Crimson Kimono” and “The Big Red One”. But for me, none of them pack the punch delivered by SHOCK CORRIDOR. Enjoy.